From playing Prime Minister to lighting up our brains, a wealth of activities and talks inspired and amazed at the It’s All Academic Festival. On Saturday, 15 September, UCL opened its doors to the alumni and public to give them a glimpse into the world-changing research taking place within its walls. The university also revealed some of its secrets, bizarre facts and hidden history. It’s safe to say that the day did not disappoint! 300 litres of water was used at our water stations to avoid 600 plastic water bottles ending up in landfill. It was a full house at The Future Human panel talk hosted by Mark Lawson. Tough audience questions about our future were posed to an expert panel including city planning specialist Peter Rees, materials scientist Mark Miodownik, physicist Chamkaur Gahg and computer scientist Sarah Meiklejohn. Mark Miodownik discussed how the materials used to make up our belongings will evolve to become far more durable and eventually ‘self-healing’. While Dr Sarah Meiklejohn explained how blockchains will be used to encourage greater transparency in the organisation and consumer relationship. If you missed out on attending this talk, watch the recording here. Guests also dared to see exactly how dirty their phones (and bags, and wallets) really are. With the help of Dr Lena Ciric and her team, hundreds of smartphones were swabbed to see precisely how many invisible bacteria were present on devices at the How Clean Is Your Phone? exhibit. We’re not sure who had the dirtiest phone, but there were quite a few surprises for those who were brave enough to be tested. The festival gave alumni and visitors the opportunity to see other planets, cutting-edge research and the latest technology with amazing opportunities to try out virtual reality (VR) and robotic technology. These hands-on activities highlighted just how far UCL’s research has come in the VR, technology and robotics space. Attendees were able to conduct an entire robotic orchestra, and explore interactive artwork on gendered species and play a VR game that collects 5 hours’ worth of dementia research for just 2 minutes of play. The sold-out Green UCL: Sustainability Tour highlighted some of the innovative work that UCL is doing to ensure a greener future for all including installing rooftop gardens, implementing a single-use coffee cup tariff and ensuring the university is energy efficient right down to the boiler room. The festival itself also championed sustainability by encouraging public transport, providing recycling bins and free water stations, the development of an app to reduce printing of programmes and gifting reusable and 100% biodegradable water bottles to alumni. Finally, UCL's past and present innovators, disrupters and entrepreneurs were also displayed throughout the Festival’s hands-on activities. These events allowed alumni to explore the university’s lasting and latest research in industries including health, education, art, politics and technology. 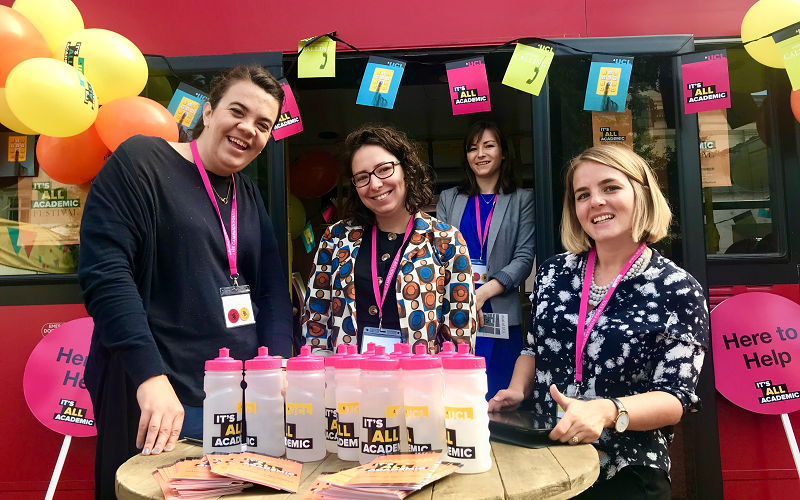 After the success of this year's festival, we are excited to announce that the next Its All Academic Festival will be taking place on 5 October 2019.